After pausing sales of season tickets earlier this week, the Dodgers are opening the door again — ever so slightly. “Upon conclusion of this week’s select-a-seat event and servicing upgrades of existing season seat holders, the Dodgers have re-assessed availability and are reintroducing season ticket sales on an extremely limited basis beginning immediately,” Dodger vice president of ticket sales David Siegel said this evening. 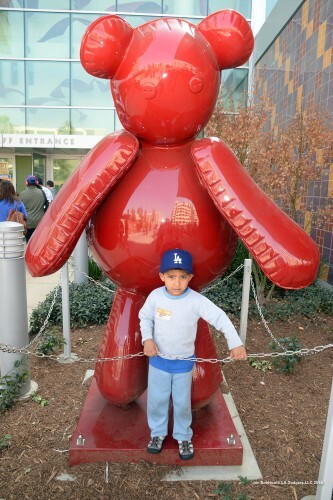 “It was important to us to do this in time for Dodgers FanFest this weekend. Chad Billingsley has thrown four bullpen sessions as he makes his way back from Tommy John surgery, reports Ken Gurnick of MLB.com. Scott Elbert is expected to throw his first bullpen this week, writes Gurnick, who also discusses other pitchers appearing at the Dodgers’ “Young Guns” pitching minicamp at Camelback Ranch last week. Dodgers president and CEO Stan Kasten spent seven minutes talking about the franchise with the guys on MLB Network’s Hot Stove Live. Opening Day Countdown Down Under is an excitingly new and self-explanatory blog from MLB.com. Follow it as we count down the days to the Dodgers and Diamondbacks at Sydney. When Hanley Ramirez increased his adjusted OPS from 105 in 2012 to 190 in 2013, it was the second-biggest increase in baseball of all-time, writes Andrew Grant of True Blue L.A.
Scott Lindholm of Beyond the Box Score compares Yasiel Puig’s first season to others with similar career starts. 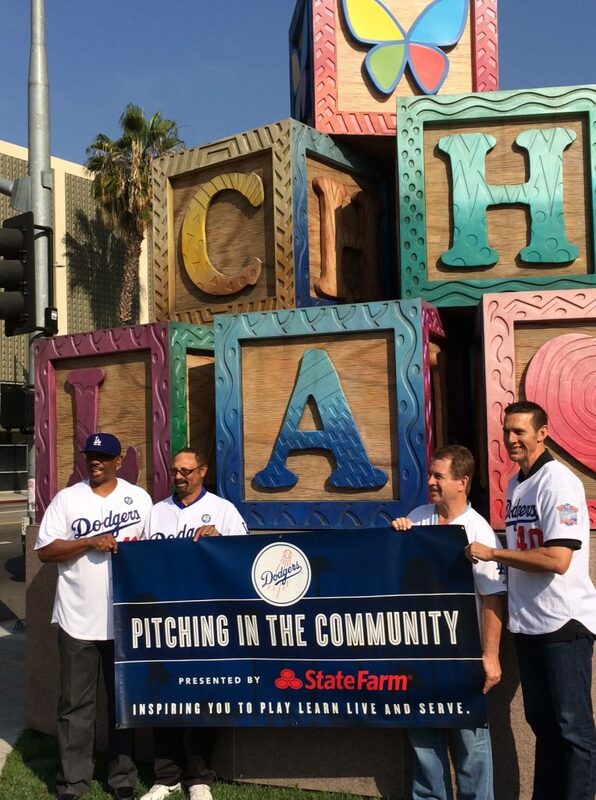 Today’s the day a bunch of current Dodgers join the team’s Pitching in the Community Caravan (presented by State Farm). You can follow along on Twitter, but I’ll update this post periodically with Josh Tucker’s tweets from the scene. 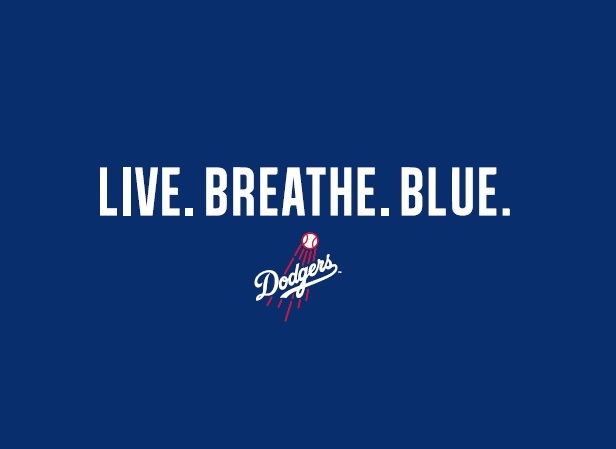 Dodgers 2014: Live. Breathe. Blue. That’s the advertising, marketing and digital campaign that will be incorporated across Los Angeles in 2014. “Live. Breathe. Blue.” was created in partnership with Walton Isaacson, the club’s advertising agency. Those who have purchased season tickets and mini plans for the Dodgers in 2014 will be introduced to a paperless ticket program that 17 other MLB teams have utilized. Ken Gurnick of MLB.com has more. … Among the fan enhancements will be the capability to load digital tickets on smartphones in the same manner that airlines provide for their ticketing. Automated turnstiles are being installed at Dodger Stadium to allow for even faster admission. Among the features to be implemented by the new platform: digital/mobile delivery to ticket holders; state-of-the-art ticket management; integrated loyalty programs; and interactive seat maps. “Paperless tickets are part of our heightened efforts to enable Dodger fans to manage their season seats better than ever,” Dodgers president and CEO Stan Kasten said in a release. Vin Scully told Steve Dilbeck of Dodgers Now that he will be in Sydney for the Dodgers’ Opening Series against the Diamondbacks in Australia. Scully said he would be in Phoenix Feb. 25 when the Dodgers’ regional sports network makes its debut and then broadcast the first spring games the next two days. He said he would return for one game against the San Francisco Giants on March 9 and return one week later for the final game in Phoenix, March16 against the Colorado Rockies before the team takes off for Sydney. The Dodgers then return home to play an exhibition Freeway Series against the Angels, and Scully will broadcast the games March 27-28 at Dodger Stadium. 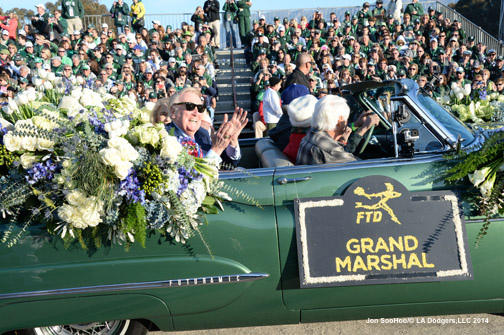 That’s a lot of work and travel for the 86-year-old broadcaster. 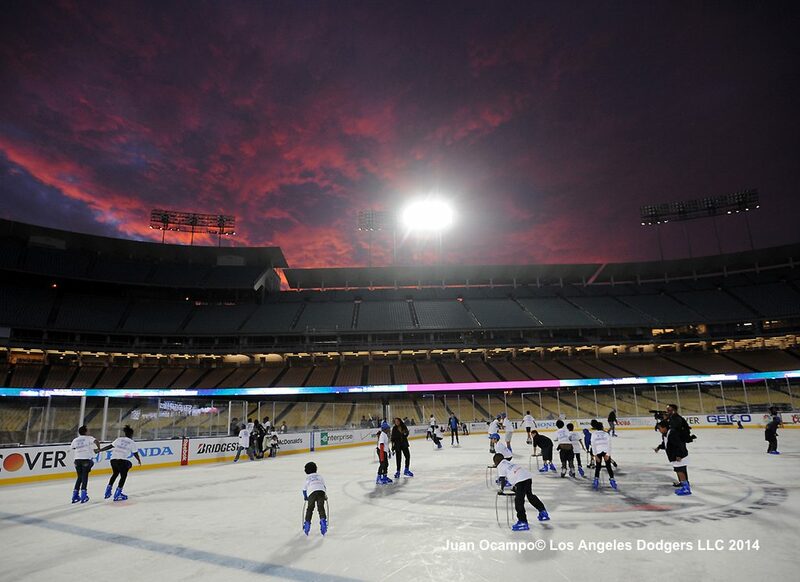 Above, fun video of the Dodgers and the kids on Tuesday’s second day of the Dodgers Pitching in the Community Caravan, including the final skate in Dodger Stadium. They began tearing down the rink today. First the astonishment, then the excitement. 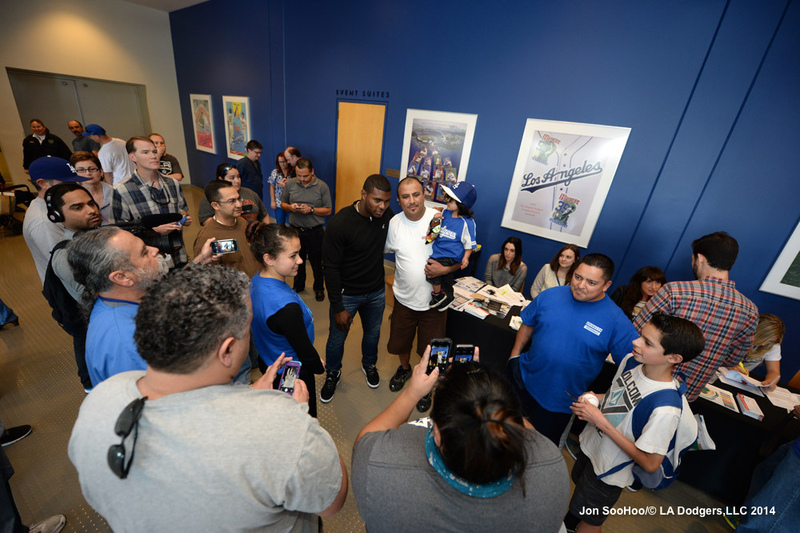 You could really feel the electricity charging through the halls of Dodger Stadium today the moment Yasiel Puig made a surprise appearance at the Select-a-Seat event for season-ticket holders. The 23-year-old outfielder, heading into his second Spring Training with the Dodgers, said he has been toiling at all aspects of his game in the offseason. “I have also been working on my throws to bases so that I can help my teammates better on the field,” he said. The Dodgers head into the launch of individual game tickets at 10 a.m. Friday and continue to sell mini plans, but they have temporarily halted full-season ticket sales at 31,000, according to Ken Gurnick of MLB.com. Vice president of ticket sales David Siegel told Gurnick that the club is evaluating whether supply will allow an additional limited number of season tickets to be sold, after an unprecedented 98 percent renewal rate from last year. To purchase individual game tickets beginning Friday, click here. 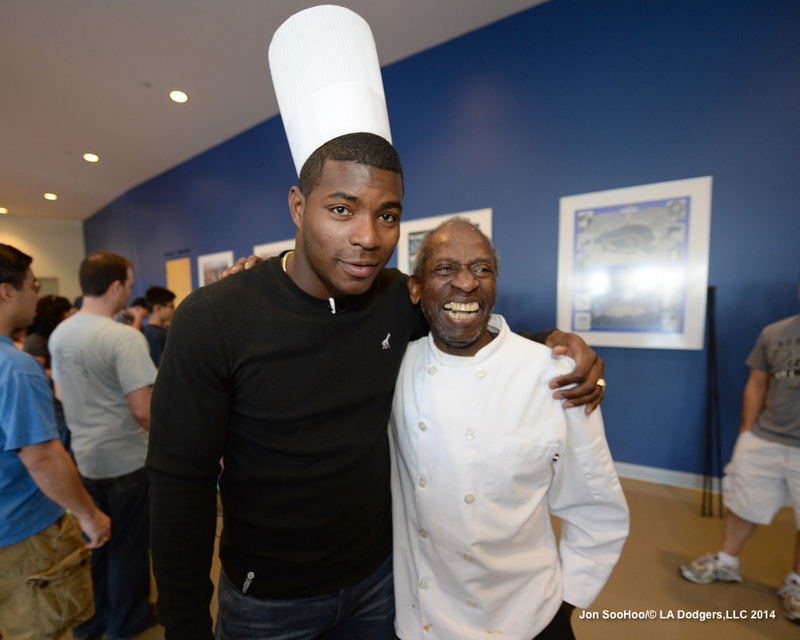 Yasiel Puig, Hyun-Jin Ryu, Carl Crawford, Brian Wilson and Alexander Guerrero are scheduled to be among the active Dodgers participating in the team’s Pitching in the Community Caravan (presented by State Farm) on Friday. 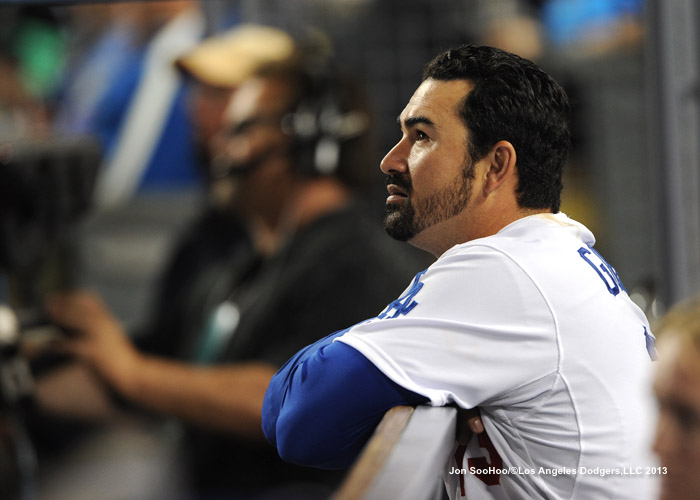 This will be Guerrero’s first public appearance as a Dodger. 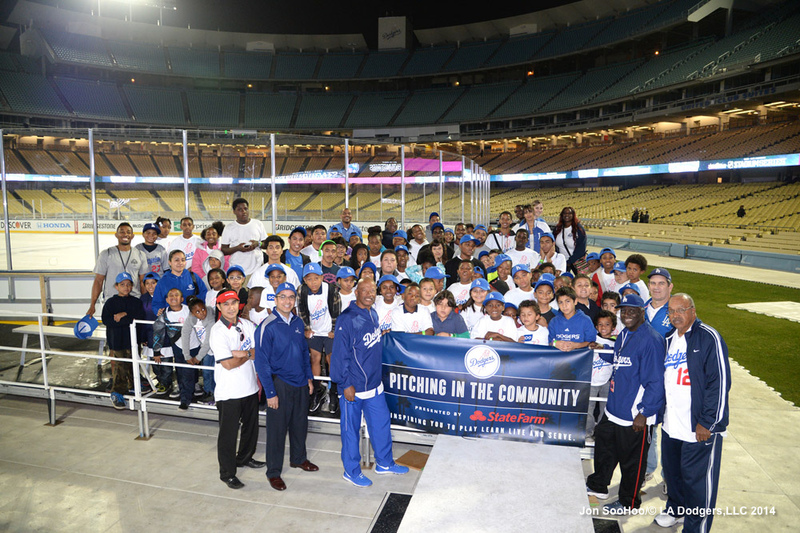 The overriding mission of the Dodgers’ community efforts in general and this caravan in particular is to build upon the team’s tradition of service with the goal of inspiring youth and adults to play, learn, live and serve. The impact the players can have is pretty priceless. Note: Caravan activities are not open to the general public, but are specifically targeted for the aforementioned groups. … a .985 OPS (.444 on-base percentage, .541 slugging percentage) batting cleanup in his first 17 games of the season — but despite reaching base 32 times, scored only three runs. … a .940 OPS (.351/.589) when he swung at the first pitch of an at-bat, despite only two walks in 185 plate appearances. By comparison, Yasiel Puig had a .927 OPS in the 187 times he swung at the first pitch of an at-bat. … 18 homers in 400 at-bats against right-handed pitching, compared with four in 183 at-bats against lefties – but delivered more doubles against lefties (17) than righties (15). … an .835 OPS at Dodger Stadium in 315 plate appearances. In 2007, while with San Diego, Gonzalez went 2 for 38 in Los Angeles. … the same OPS in August as he did in September: .772. And that includes wrapping up the regular season with a .945 OPS in his final 22 games. … a line of 6 for 11 with two doubles as a designated hitter or pinch-hitter. … runs in nine consecutive road games from July 10-August 2. … 14 home runs in 285 plate appearances after pitchers got first-pitch strikes, compared with six home runs in 283 plate appearances after first-pitch balls. … a 1.099 OPS in the seventh inning and a .461 OPS in the eighth inning. … eight infield hits, four more than Zack Greinke. What’s the all-time Dodger team of single-season performances? Matt Snyder of CBSSports.com makes his picks. Keith Law of ESPN.com ranks the Dodgers’ farm system 11th in baseball. In this post about the superb hitting by Dodger pitchers last season, Daniel Brim of Dodgers Digest notes that it was the fourth-best performance since 1990. Though Zack Greinke figures to regress after his phenomenal season at the plate, Dan Haren (career .240 on-base percentage) might help the cause. Charlie Osgood, who pitched in one game for the Dodgers in 1944 during World War II at age 17, has passed away, notes Baseball Happenings (via Blue Heaven). He was a nephew of famous Dodger coach Clyde Sukeforth. A type of protective cap for pitchers to use on the mound has been approved by MLB, reports William Weinbaum for ESPN.com. “We’re excited to have a product that meets our safety criteria,” Halem told “Outside the Lines,” adding that baseball will continue its efforts to come up with more options. Historic Dodgertown in Vero Beach will host a game between the Brevard County Manatees and Lakeland Flying Tigers on April 15 in celebration of Jackie Robinson Day. Recent Dodger signee Chone Figgins is among the baseball veterans attempting to make comebacks that Cliff Corcoran writes about at SI.com, but the most interesting tidbit might be about Mark Mulder, who is trying things out with the Angels. “By 2011, Mulder had settled into retirement as an analyst for ESPN, but while watching Dodgers lefty Paco Rodriguez pitch in last year’s playoffs Mulder was inspired to imitate his delivery and discovered that doing so restored the life on his pitches. Peter Gammons wrote at Gammons Daily that the Dodgers are the team to beat in the National League West, but that the division will be interesting this year. The inimitable Pete Seeger, who passed away Monday, can be heard discussing baseball — including the integration effort — on these videos shared by Craig Calcaterra at Hardball Talk. 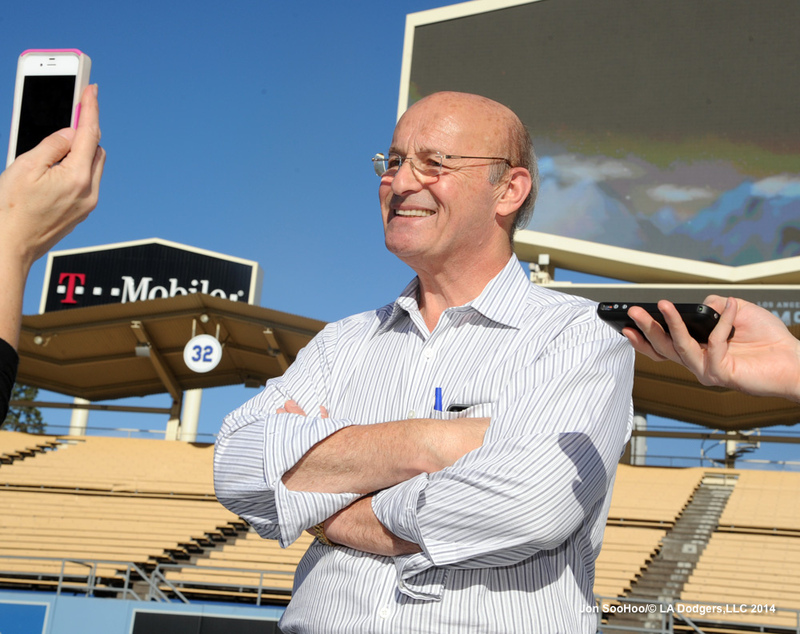 Dodger president and CEO Stan Kasten has been named 2013 Sports Executive of the Year by the Los Angeles Sports Council, which will present him with the honor during the ninth annual L.A. Sports Awards March 5 at the Beverly Hilton. Kasten was honored for his work helping to mold the Dodgers into a National League Championship Series team in only his second year with the franchise. 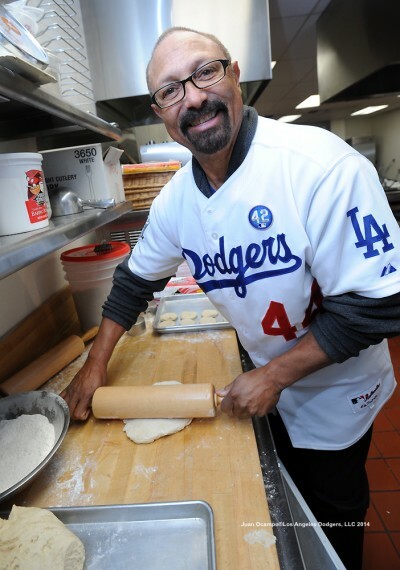 “He has helped to re-energize the team’s fan base and re-establish the Dodgers as one of the leading brands in all of team sports, with a team built for long-term success on and off the field,” the LASC said. Prime Ticket will televise the L.A. Sports Awards on March 14, and through Friday, you can vote on the top moment of the year. The event raises money to further the LASC mission of promoting economic development through sports in greater Los Angeles. In addition, Kasten has joined the board of directors for the LA84 Foundation, which serves as a key funder for youth athletics in Southern California. People will talk about Matt Kemp’s hurdles in 2014 coming back from multiple injuries, but Kemp would be the first to put those hurdles in perspective. A surprise visitor today at Children’s Hospital Los Angeles, joining Dodger alumni Ron Cey, Ken Landreaux, Matt Luke and Dennis Powell on the first day of the Dodgers Pitching in the Community Caravan (presented by State Farm), Kemp was eager to spread good cheer but had to take some deep breaths on the way. “It’s definitely difficult,” Kemp said. “Kids honestly don’t deserve to go through this. They didn’t ask for this. Me growing up, I had a normal childhood, I was healthy … but some of the things these kids have been through, I wouldn’t know how to react or how to handle these situations. So yeah, it’s tough to come here, seeing some of these kids with their childhood taken away. Told that was a big responsibility, Kemp agreed but believed he could make a difference, saying that “if it’s me just saying ‘hello’ to a kid, giving a kid a Dodger hat or something that makes their day, that makes them eat” when they might otherwise feel too weak to do so, he was game. As for himself, Kemp hasn’t completed his recovery from every injury that set him back in 2013 — namely the ankle — but feels he is right on track. “I feel great. Just got done working out not too long ago. I’m pretty pumped up for the upcoming season and what’s going on, and hopefully be injury-free this whole year and have a great season.